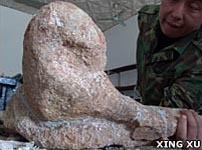 The fossilised remains of a giant bird-like dinosaur were uncovered in the region of Inner Mongolia, China, in 2007. 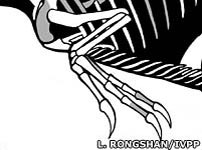 While some were theorising that meat-eating dinosaurs became smaller as they evolved to be more bird-like, this beast weighed about 1,400kg (3,080lbs). That's about thirty-five times heavier than other similar feathered dinosaurs. Nature journal reported that the beaked animal was eight metres long (26 feet) and twice as tall as a man at the shoulder; and yet it was only a young adult when it died. The authors suggested the dinosaur's enormous size was due to a fast growth rate, faster even than that of the precocious Tyrannosaurus rex. In truth, though, just what it ate really is a mystery. Gigantoraptor erlianensis had some features which are associated with meat-eating dinosaurs, such as sharp claws for tearing flesh; but it also had some features which were associated with plant-eaters, such as a small head and long neck. The researchers had originally thought they had found the bones of a tyrannosaur - the group of dinosaurs to which T rex belongs - due to their large size. The team has established that the creature lived about 70 million years ago, in the late Cretaceous period. According to lines of arrested growth which were detected on its bones, it died in its eleventh year of life. It was a very surprising discovery, according to the researchers. Not at all what they were expecting. 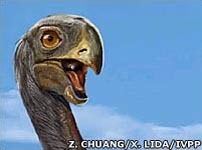 One of them, Xu Ling, a palaeontologist at the Chinese Academy of Sciences in Beijing and co-author on the Nature paper, thought it was the largest feathered animal ever to have been discovered. Dr Paul Barrett, a dinosaur researcher from the Natural History Museum in London, UK, stated that it belonged to a very unusual group of theropod dinosaurs, which are normally meat-eaters. But this one didn't have any teeth, so what it ate is still a very intriguing mystery. The researchers showed that it had a very fast growth rate, so it probably got so big by undergoing a very rapid growth spurt, rather than growing for a very long period of time. Dr Barrett added that the animal was not on the direct evolutionary line leading to today's birds. However, because of that very fact it supported the notion that the features associated with modern birds probably arose more than once in their close relatives.